Samford University’s Brock School of Business sports marketing program has entered into an alliance with Affinio, a leading audience-insights company based in Canada. Samford students will use Affinio’s unique social media analytics tools to develop unprecedented insights into fan behavior related to college and professional sports teams, sports leagues, sports brands, sports sponsors and high-profile athletes, according to Darin White, founder and coordinator of the program. Through this alliance, Affinio will provide Samford sports-marketing students the ability to undertake projects with college and professional sports teams that reveal previously untapped insights that exist within a team’s fan base. These projects will shed light for the first time on the diverse personas that make up the fan base, and what players and brands they are most influenced by, discuss, share, and ultimately care most about. 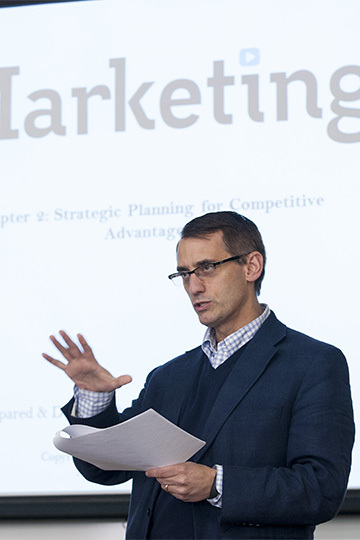 Samford’s sports marketing program in Brock School of Business is one of the only programs of its kind housed in an AACSB-accredited business school. Samford’s sports marketing program offers students a chance to develop their skills for a career in the $500 billion global sports marketplace. With faculty considered leaders in their field and out-of-classroom experience, students can combine their passion for sports with professional training unmatched by any other AACSB business school in the South. White is a leader in the field of sports marketing. He serves as chair of the American Marketing Association Sports Marketing SIG, the premier international academic body responsible for advancing scholarly research in the field of sports marketing. For more information about the program, go to samford.edu/business/sports-marketing-concentration.